After narrowly escaping a horrendous encounter with an acid breathing dragon by winding their way through a narrow cave tunnel, the party returned to the kobolds' lair. Momentarily they could hear the enraged roars of the dragon behind them, but it was soon replaced by that barks and screeches of hoards of kobolds in pursuit. They fled through the winding corridor back to the ruined smelting chamber and up the immense, winding stone staircase. Once at the top they were relieved to find their rope still in its place on the oil-slicked ramp, which they all hurried up as the sounds of kobolds echoed all around. They quickly moved into the Great Forge Hall to make their way to the stairs up to the first level. 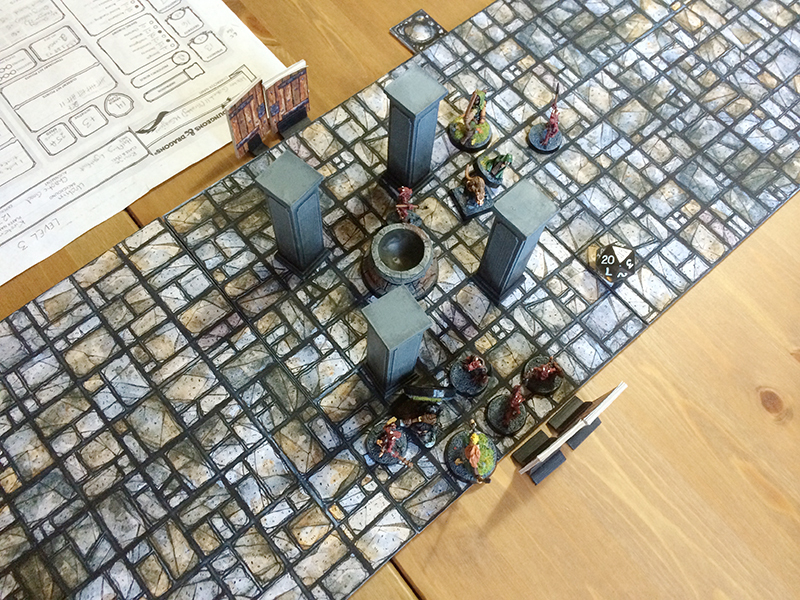 Just as they ran past the Great Forge a set of doors ahead of them swung open and a small group of kobold warriors jumped out, accompanied by two sentries mounted on disease-ridden giant rats. Simultaneously another, larger group poured out of the doors to the south-west. Concentrating on the kobolds blocking their path, the party managed to fight their way through, pressing on towards the stairs. Broak slowly fell behind as he tried to beat back the oncoming wave of kobolds to give his allies more time to escape. Audrey, still severely wounded from her encounter with the dragon downed a healing potion—most of which she wound up spilling on herself. After felling several kobolds, reinforcements continued to stream from the south-west corridor and as Ander and Audrey made their way up the stairs. Seeing Broak greatly outnumbered, Grabby stood by the dwarf's side to help him fall back. Broak then decided he needed to bolster his efforts. After a quick discussion about player knowledge, Broak quaffed his potion labeled "Dragon's Breath." He stood blocking the entrance to the stairs and mercilessly crushed kobolds with his hammer, Dwarven Despair, and spewed fire from his mouth (singeing his beard hair a bit) causing sever kobolds to fall to the ground engulfed in flames. 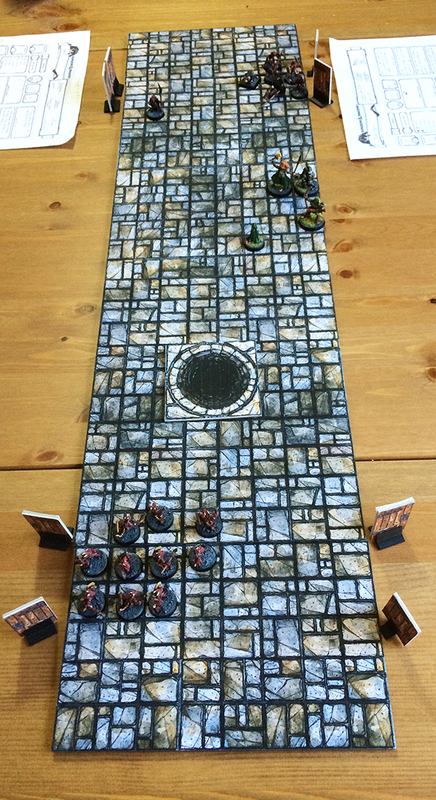 As Grabby and Broak ran to join their allies, Ander tossed caltrops on the stairs to impede the kobolds' progress. 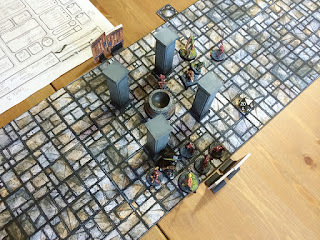 Between the caltrops and a fire-breathing, enraged dwarf, the kobolds backed off, knowing they had another force already waiting for them in the next chamber—led by their chief. 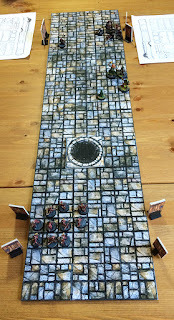 The party quickly moved through the chambers with the statues of Moradin and other dwarves then through the corridor that opened to the Great Hall. They burst through the doors to find the kobold chief and his elite guards (all mounted on giant rates) and a retinue of warriors, as well as a robed kobold who stood close to the chief. 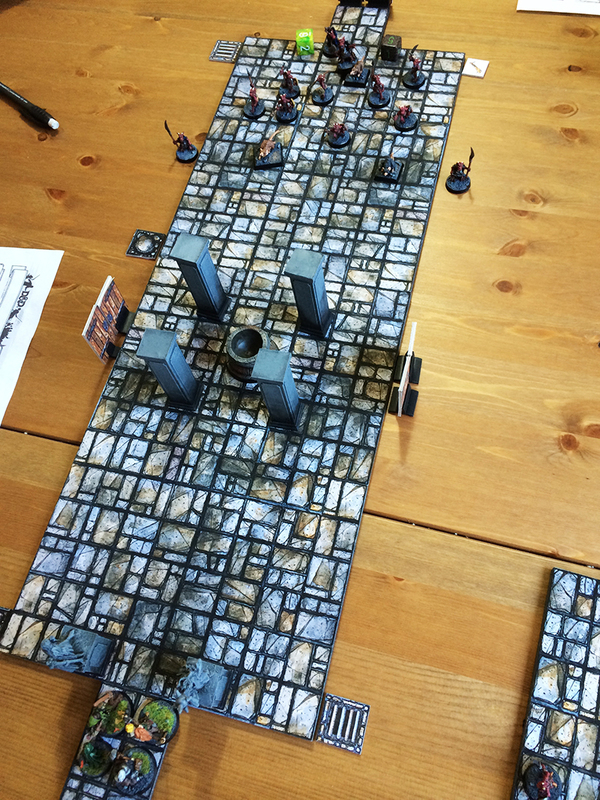 Knowing the only way out was through the group of kobolds, the party charged forward, using the pillars and well for cover as they moved up. Audrey and Broak off to the right while Ander and Grabby moved up the left flank, meeting the kobold force in the middle. A fierce melee ensued, with Ander trying to make his way toward the chief and Grabby finding himself in sufficient cover to deliver a killing blow from the shadows on an unsuspecting kobold going after Ander. Ander managed to weave his way past the pillars, stowing his bow and drawing his gleaming, razor-sharp dual scimitars, he dove into the fray with a searing ferocity... and missed, and missed, and missed again, turn after turn he was an elvish whirling dervish of failure. Seeing his elvish friend not faring well, Grabby moved into flank the chief and his guards, eventually the two of them managed to bring them down. With the kobold chief lying in a heap on the floor, Grabby decided to throw caution to the wind and leap on the back of the chief's rat-mount. Amidst the din of battle, a great crashing of stone and wood could be heard from beyond the doors to the west, and the bellowing of the enraged dragon followed—he had come down the lift room (from where the party was attacked by the bats). Meanwhile, Broak and Audrey stood side-by-side defending their position from the onslaught, but while Ander was rolling miss after miss, I was rolling critical hit after critical hit. First Broak fell from a well-placed spear thrust from one of the warriors, and despite drinking another healing potion given to her by Broak just moments earlier (most of which she also seemed to spill on herself) she was also cut down by a kobold's spear. After seeing their chief brought down, many of the remaining kobolds darted back into their tunnels to escape, while a couple remained fighting, but were quickly dispatched by Grabby and Ander after Grabby realized he couldn't control the rat he decided it was best to drive a dagger into the beast's brain. The kobolds slain or retreated, Ander and Grabby rushed in to help rouse their unconscious allies, with the sound of the dragon drawing ever closer down the corridor. Once everyone was on their feet, Ander ran to the doors to set his warhammer through the door handles in attempt to slow down the beast. Just as the party was leaving the Great Hall, the group looked over their shoulders to see the doors from the west corridor explode into a shower of splinters and buckled iron as the dragon smashed its way through, stick it head through and roar in fury. The group rushed up the long staircase with Ander falling back slightly to unleash arrows should the dragon make its way to the stairs before they could reach the safety of the surface. Once at the top of the stairs they found the trap door to the surface held fast (if you recall, the entry only appeard in moonlight, it happened to be about 8:30 in the morning now). Broak put his weight into it, and while it was heavy, he felt the door had some give to it. With Audrey helping (and Grabby standing nearby unable to help), Broak put his back into the door and it began to move, spilling earth and stone on them as they pushed with all their might. Soon the dragon stuck its head into the stairway, roared, and began charging up towards the party with Ander firing off arrows as he moved up the stairs. All eyes were fixed on the charging dragon that filled up the stairway as Audrey and Broak continued to force the door open, until at last a stream of morning light started to break through and they could smell the fresh air. With one final heave, they pushed the door opened and leapt out, quickly followed by Ander and Grabby with the dragon close behind them. Although the opening would be too small for the dragon to fit through, they didn't take any chances and pushed the pile of earth and stone into the opening to seal it off. After taking a moment to catch their breath they found a smoldering camp fire, and a cart laden with gear, tipped over, still roped to a horse who lay dying on its side, ripped open by a pair of immense claws. They also found the remains of the other guard that Boots had come with: reduced to a pile of melted organs and exposed bone, only his forearms, lower legs and the top of his head were recognizable, an obvious victim of the dragon. Seeing nothing of value that could help them in the cart, they quickly moved on knowing the dragon would most likely be coming to the surface exact his revenge. The party moved on quickly but cautiously, staying in cover until night fall. Occasionally they stopped and hid when they heard the ominous roar of the dragon echoing of the mountains, and on a few occasions saw it soaring overhead, searching. With night upon them they set about making camp (with no fire, of course). All of the characters will be at level three where they get to select their class' path, and Boots should be back in the mix.